I think I'm missing a pair of pedals. The Shimano clipless ones that I got from Jensonusa. 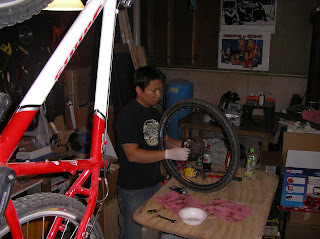 I think bike parts walk around in the darkness of my garage late at night. Sometimes in the early hours of morning I find myself suddenly awake, trying to listen to that clanging sound emanating from somewhere below the bedroom floor. I could swear I heard something. Heard something. Metal against the concrete wall. A dull thump. Or was it just a dream? And it if was, what the heck was I dreaming about? I strain to hear more but there is only silence and then the occasional blowing of the wind, and the rustling of the leaves. I try to picture the bent rim that I disentangled from the spokes that held it concentrically to the hub. It lays on the cold and dusty garage floor. It flips up unsteadily at first like it is being pulled up on strings by an invisible puppeteer. Then it begins to roll clumsily, a child learning how to walk (or roll). It bumps up against my work table and it flutters for a moment, a beg-your-pardon gesture before it swirls towards the floor the way a spinning coin settles to stillness, flat on its side. The work table seems unmindful, yet it seems to be alive. My crescent wrench, the 5mm allen, a tube of grease, dirty rags, nuts and bolts, a whole slew of tiny little bike parts, parts of bike parts perched upon the work table, a hippopotamus with birds on its back. Suddenly the parts come together as if attracted to the middle of the table by a magnet. A metallic creature emerges from the pile, my Shimano Flight Deck sitting on top of the suspension front fork, crank arms attaching to the steerer tube living up to its anatomical nomenclature. The thing suddenly croaks that he is Steve Inskeep and that this is morning edition. And now I am really awake. Love your sense of humor. Very creative. I'm a recreational rider. These are my stories.